Somewhere between the muffin and the blueberry pancake, with the sweet tang of natural yoghurt. Let’s just all agree that this constitutes one of your five-a-day. Breakfast muffins, like these, are best enjoyed warm from the oven, with a newspaper, coffee, and friends. Mix flour, sugar, baking powder, and salt in a bowl and set aside. Whisk yogurt, oil, and egg to combine before adding dry ingredients and mix until only just incorporated. 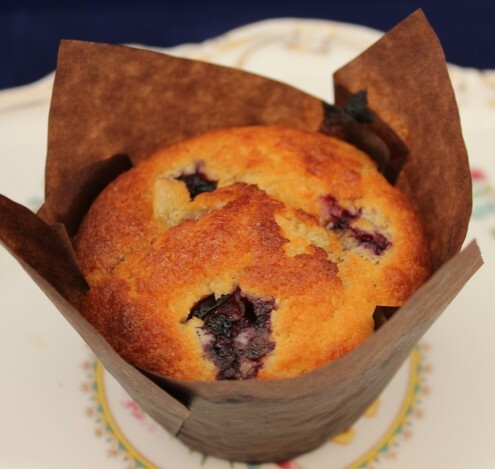 Gently fold in the blueberries and spoon the lumpy muffin mixture into your prepared tin. Bake for 18-20 minutes and pour a scant drizzle of maple syrup over each muffin as soon as they come out of the oven. Cool the muffins in their tins for 5 minutes before cooling on a wire rack for a few minutes more and enjoying warm.